Sterilise your seal tight jars: submerge them, and their lids, in a large saucepan filled water and then boil on a low heat for 10 minutes. Take 200ml vegetable oil, and bring it to a low-medium heat in a saucepan or wok. Turn off the heat, and then remove the garlic skins by sieving the oil. 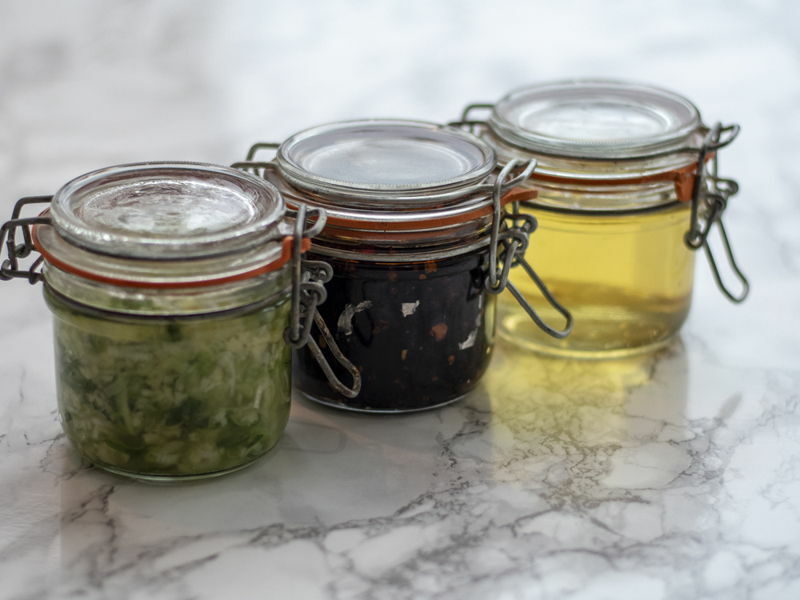 Transfer your newly made garlic oil to one of your 250 ml sterilised, seal tight jars and store for up to 3 weeks. Finely chop the fresh chillies, garlic, ginger and red onion and set aside ready to fry. Heat 3 tablespoons of vegetable oil to a medium heat in a saucepan. Once the oil is hot add the chillies, garlic, ginger and red onion and stir through, then turn the heat down to a low-medium heat. Continue frying, stirring occasionally for 10 minutes, until the onions have softened and completely browned. At this point, add the chilli flakes and continue frying whilst stirring intermittently on a low heat for 5-6 minutes (Hint: turn your extractor fan on high to help with your breathing). Now turn the heat up to a medium-high heat, and then add the tomato purée, light soy sauce, dark soy sauce and sugar to the pan. It should start to bubble up quite quickly, with chilli fumes really hitting your nose at this point. Turn down to a medium heat and continue to stir the mix until it starts to become thicker and ‘jammy’ in texture. Once thickened, add your water and turn the heat down to low. Cook through until the colour starts to really darken, but not burn (this caramelisation is what creates the real flavour of the chilli oil). Once you have a thick, dark, reddish brown ‘chilli jam’, the base of the oil is ready and can be removed from the heat. Transfer your chilli jam into one of your sterilised jars and top with the rest of the vegetable oil before closing. Allow to cool completely before placing in the fridge. The chilli oil will taste best after 1 week in the fridge and keep for 1-2 months if kept clean. Finely chop the ginger and spring onions. Place them, along with the salt, in a small serving bowl and mix together. Heat the oil in a small frying pan until smoking-hot, then pour over the ginger and spring onion to sizzle. Mix together well. Transfer the ginger and spring onion oil to the last of your sterilised jars, and close the lid!